I have talked about glogs before. This is an excellent glog of students working the math vocabulary! Foldable books can be a great tool for helping students to organize, display, and arrange information, so that they can practice and master the math they are learning. Dinah Zike does some excellent work with foldable books. Here is a great site that talks about her ideas for math foldable books. Here is a great website with some step by step picture instructions/examples by Carol DeFreese (scroll down to the middle of the page). Carol has also provided blank foldable templates so you can create your own foldables. Here is another website with pictures of students’ foldable projects. Here is a multiplication foldable. Here is another resource for different types of foldable books. Here is a geometry study unit with foldables for middle school and high school topics. 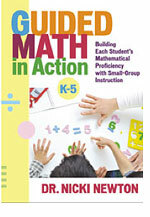 Here are 5 great blackline masters resources for place value. and then when you get to the abstract it will all make sense! A. Pick a card and write the name. B. Pick a card and build that number with base ten blocks. C. Pick a card and draw that number with base ten blocks. D. Pick a card and show it with paper base ten blocks. 3. A great resource packet (although the money stuff is Canadian). Here are some ideas for Valentine’s day math! Here are some graphic organizers to get your students writing their own math problems and questions. Here is a great sample of writing about fractions in story form. I really like the way they set it up as an individualized student book. This really helps students to discuss fractions as well as make connections to real life. I would discuss this in small guided math groups. You could follow this template for whatever city you live in. Depaul has set such an excellent example with this series of math graphic organizers.